We are excited to offer a guest post from Hena Khan about her Muslim-themed picture books. At Mackin we were thrilled at her use of colors to explain aspects of Muslim culture when Golden Domes and Silver Lanterns: A Muslim Book of Colors was first published. And her newest book, Crescent Moons and Pointed Minarets: A Muslim Book of Shapes, can be used to teach shapes in math and an unfamiliar (for many) world culture in social studies. Check back tomorrow to enter a contest to win a copy of Crescent Moons and Pointed Minarets: A Muslim Book of Shapes! A group of teachers squeezed into an area by a large window, seated on plastic folding chairs, at a charming bookstore in Old Town Alexandria, Virginia. Surrounded by bookshelves, there was the hum of chatter among friends and colleagues gearing up for back-to-school. After an elegant reading specialist from the county introduced me as a guest author and thanked me for joining them, I took a deep breath and started my presentation, hoping to make an impression. But, as has happened so many times, I ended up both impressed and moved by my audience. “I grew up attending public schools next door in Maryland,” I started, sharing a few details of my personal background, growing up in a DC suburb, and visiting the public library religiously as a voracious young reader. I mentioned how I, like many other minorities, never experienced finding a character that reflected me and my family on the pages of a book until I was a grown up, and how I only realized later in life the profound ways that impacted me. Next, I spoke about becoming a mother and wanting more for my son, and about how grateful I am to Chronicle Books for publishing Night of the Moon, my first picture book, over a decade ago, at a time when there was virtually nothing like it on the market: a storybook about a Muslim kid intended for everybody to read. The book is about the month of Ramadan, seen through the eyes of a child who is watching the moon change shape over the month. I had dreamt of my kids going to a public school or library, finding books about them, and feeling validated and included. And I’d wanted others who were unfamiliar with Muslim traditions and culture to have an opportunity to learn about them in a friendly, accessible, entertaining way. And, thanks to my editor and my publisher, it was actually happening. I mentioned that since then, people have told me countless times that they’ve learned something new through my picture books—not just kids, but parents, grandparents, and educators, too. In fact, a librarian at a prestigious K-12 private school shared with me last spring that she finally understood the difference between the words “Muslim” and “Islam” when she’d read the glossary of one of my books. I’ve come to realize over years of visiting schools that I need to define every term and not assume that kids and teachers know even the very basics about my faith. And why would they? We generally don’t study religion as a part of social studies units in schools in America. Even when it does make its way into a curriculum, it’s a subject that, understandably, makes many educators nervous. Some may hesitate to teach a topic they don’t understand well themselves. And then, I spoke about the alarming rates of bullying that American Muslim children are facing in our schools, especially over the past couple of years. This is a trend that must be halted and reversed, and educating kids and helping them to see that Muslims have a lot more in common with them than they might realize is an important start. As I shared this, I saw surprise on a few of the teachers’ faces, and sympathy in all of them. One hand went up, and a young teacher, grasping the notebook in her hand, asked me what others in the room were thinking. “I want to have these conversations with my kids,” she said. And then, after a pause, she added, “But how do you keep it from going off-topic?” As the others nodded in agreement, I understood her concern. What if, when trying to build compassion, tolerance, and understanding, the discussion veers into areas that are uncomfortable or controversial? How do you rein it in, and get back on track? How do you counter the notions and negative perceptions that kids may already have, or that they may be hearing at home or in their communities? I took a deep breath, and tried to steady my voice. It breaks my heart that questions like those need to be asked, but I’m grateful for them. I shared how my second picture book, Golden Domes and Silver Lanterns: A Muslim Book of Colors introduces objects and concepts that are significant to Muslims through the use of color. I’ve been humbled to see the multitude of creative ways educators have incorporated it into their classrooms and media centers—everyone from pre-K through high school. Its recently released sequel, Crescent Moons and Pointed Minarets: A Muslim Book of Shapes, is set around the world, representing some of the varied places Muslims celebrate their art, architecture, culture and traditions, as readers learn about shapes. It’s been lovely to hear people express excitement to use Crescent Moons and Pointed Minarets this school year for everything from units on social studies and art—to geography and geometry. As much as I can understand the nervousness around discussing Islam in the current climate, I’ve found that the kids I have spoken to, of all backgrounds, in urban and rural settings, across our nation, are universally curious to learn more. They generally understand that there are topics that are appropriate for school and those that are not. And they realize that their teachers may not have the answer to every single question in the universe, but that’s what Google is for (totally kidding—there is particularly bad information about Islam on the internet, so please search with caution). A great number of kids have no idea what a Muslim is. Some are familiar with the term. A few know a lot about Islam or are Muslim themselves. But all of them are eager to share similarities and make connections, ready to ask questions, and willing to accept differences. And teachers are key to fostering this learning, and laying the foundation for compassion and tolerance. While you are in the process of diversifying your bookshelves and reading lists, I hope you will consider books by Muslim authors. I’m delighted to share this resource guide, filled with activities and guided discussion questions for the three picture books mentioned here. Best wishes for a wonderful school year! Under My Hijab (ill. by Aaliya Jaleel). 9781620147924. January 2019. Gr PK-3. Crescent Moons and Pointed Minarets : A Muslim Book of Shapes (ill. by Mehrdokht Amini). 9781452155418. 2018. Gr PK-3. Golden Domes and Silver Lanterns : A Muslim Book of Colors (ill. by Mehrdokht Amini). 9780811879057. 2012. Gr PK-3. Night of the Moon : A Muslim Holiday Story (ill. by Julie Paschkis). 9780811860628. 2008. Gr K-2. Amina’s Voice. 9781481492065. 2017. Gr 4-7. Power Forward (Zayd Saleem, Chasing the Dream, Book 1). 9781534411982. 2017. Gr 2-5. On Point (Zayd Saleem, Chasing the Dream, Book 2). 9781534412026. 2018. Gr 2-5. Bounce Back (Zayd Saleem, Chasing the Dream, Book 3). 9781534412057. October 2018. Gr 2-5. 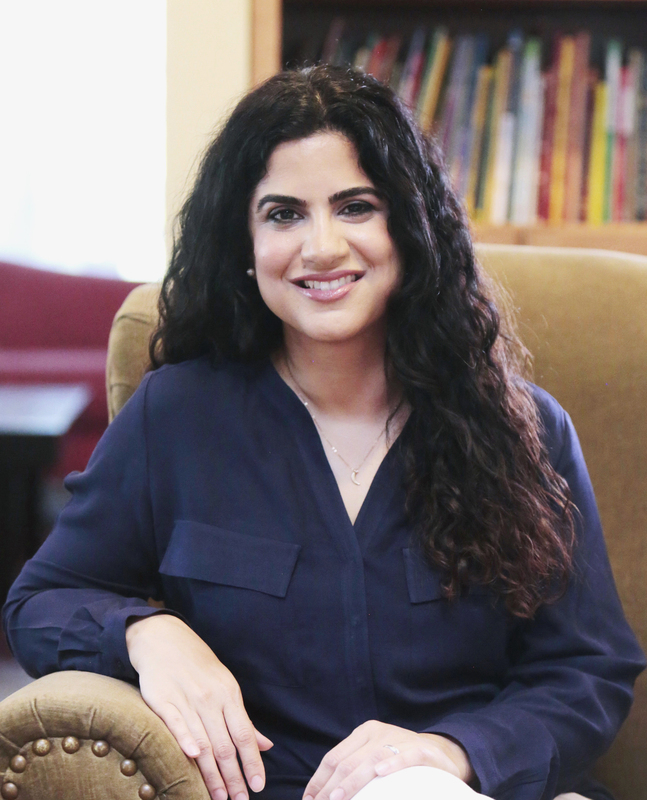 Hena Khan is the author of Golden Domes and Silver Lanterns: A Muslim Book of Colors ; Night of the Moon: A Muslim Holiday Story; Amina’s Voice; It’s Ramadan, Curious George; and other books for children. Hena is a native of Rockville, Maryland, where she lives with her husband and their two sons. You can learn more about her at www.henakhan.com or follow her on Twitter.